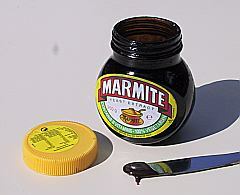 I love Marmite but never really gave it much thought as something other than a yummy start to the day. Sometime ago I idly “Liked” the Marmite page on FB as it was funny and well written. In my sidebar I just noticed a Marmite post on the small ticker and actually clicked on it. The Marmarati – how funny. I actually found myself sharing details and engaging as it tickled me. I know it is just clever tricks to capture info and profile etc. I get all that. What made me write this was standing outside my body and observing my – normally grumpy and obstructive self when it comes to the “who are you” questions – merrily filling in, accurately, all the info capture to become one of The Marmarati. I intellectualise this sharing by viewing it as my rewarding wit, effort and creativity – sadly lacking in most online stuff – with accurate personal data. The question on age had a genius addendum. I normally lie extravagantly and try to make myself at least a Centurion, but didn’t. Marmite has just secured the holy grail of customer info and I was a willing participant in the process. Who’da thunk it?